I was thrilled when Professor Ken Lokensgard invited me to present a guest lecture in his class on fly fishing and religion. 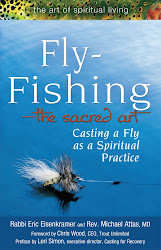 Ken teaches in the religion department at Gettysburg College in Gettysburg, PA. Once every other spring, he offers a class on fly fishing and religion entitled “Fly-fishing in Spirit, Language and Practice.” We chose a late April date for my visit to Gettysburg. 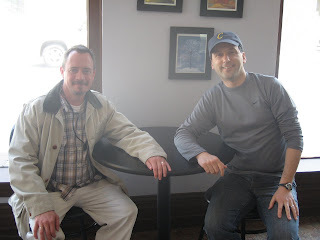 After an impossibly long drive from New York City to Gettysburg in the rain, I met Ken for lunch. Ken is from Missoula, Montana, which instantly gave him fly fishing credibility in my eyes. He does his research on the religion of the Blackfoot Native American tribe. I also discovered that like me, Ken is a fly fishing fanatic, taking trips in Pennsylvania and Montana as often as he can. Ken even had a small dry fly prominently mounted on the dashboard of his car. As we got to know each other during my three day visit, I was amazed how much we had in common. Ken and I study and teach about religion and we are both obsessed with fly fishing. We had many great discussions about Native American religion, Judaism, the midge fly fishermen of Central Pennsylvania and fly fishing trips to Mon tana, Colorado and Argentina. I joined Ken’s class on a Tuesday morning at 8:30 am to offer my presentation on Judaism and fly fishing. Ken told me that he invited many guests to speak over the semester, including a member of the local Trout Unlimited branch and a devout Christian who loves to fly fish. However, I was the first rabbi to lecture in his class, and perhaps the first rabbi that many of his students had ever met. The twenty five or so students listened attentively as I spoke about the basics of Judaism, how I discovered my love of fly fishing, and the connections that I see between fly fishing and Judaism. We had a great discussion about the ethics of fly fishing and if fly fishing for sport is humane. We even debated if it is morally acceptable to mount a fish that you catch on the wall. (I practice catch and release fly fishing most of the time, but I do keep the occasional trout for food. Since you cannot eat a fish that you mount, I argued that it is not a good idea.) When the class ended, I felt that I had made connections with the students and that we benefited from the time that we spent together. When I was not in the classroom, or visiting the Gettysburg Hillel where the Jewish college students gather for prayer and programs, I was fly fishing. Ken and John, a local guide, took me fly fishing on the famous central Pennsylvania streams. 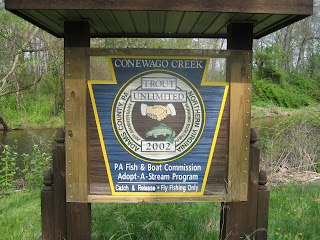 We fished the Yellow Breeches River, Letort Spring Run and the Conewago Creek multiple times. The fishing was hard. John, who works at the local fly shop, is an excellent fly fisher; he caught and released many trout on small rainbow midges. I was not so fortunate, hooking only one small trout on the Yellow Breeches that broke the line before I could get him into the net. The afternoon we spent on the Letort Spring Run was memorable more for its connection to fly fishing history than catching any fish. 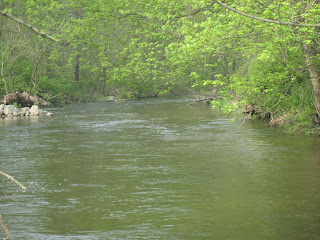 The Letort is an extremely difficult stream to fish, filled with wild brown trout who will not rise easily to a fly. Two central PA fly fishers, Vince Marinaro and Charlie Fox, unlocked the secrets of this stream, fishing long leaders and small tippets. Vince one said: “The Letort is a hard taskmaster and does not treat lightly any violation of dry fly technique.” The only mark I could make on the Letort was leaving my Fly Fishing Rabbi card there. About ten feet off of the stream, there was a black mailbox with a small binder in it. I added my card to the collection of others from fly fishing guides and stores and I felt like I was a small part of the long history of this place. On the last morning of my trip, I had a decision to make. I had told myself that I would take some time during the three days to visit the Gettysburg site and learn more about the famous Civil War battle. On the other hand, it was shaping up to be a fine fly fishing day, slightly overcast, and I had not caught any trout on this trip. So I returned to the Conewago Creek, and tried not to chide myself too much for missing the opportunity to visit the battle site. 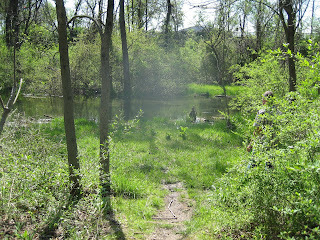 I was by myself, fishing a hole that Ken had shown me the previous day, and that I knew had a number of trout within. After much casting with no success, I decided to try a new fly, a size 16 Zug Bug with a small sinker on the line. I sent the fly into the stream about twenty feet above the fishing hole, and literally walked down the bank, the rod in my hand, to let the fly drift naturally towards the fish. Within an hour, I caught and released four rainbows and browns in the vicinity of twelve to fourteen inches. Then on one cast, a trout took my nymph, and I felt something that I had never experienced before, the weight of a truly large fish. I had no power over this trout. My rod was bent in a deep arc, and each time I tried to reel him in, I felt the weight of the fish resisting me. It was like trying to move a big heavy rock in the water. Then the trout leapt into the air. He had to be at least eighteen inches, and came back down into the water with a splash, as if to taunt me and show me his greatness. I was ecstatic, having never hooked a trout this large in my life. For a few minutes, I tried to reel him in, but eventually my inexperience with such a large fish got the best of me, and he broke the line. When the trout escaped, I jumped in the air in my excitement like a little kid, mimicking the trout who had leaped out of the water not a minute before. I felt like a ten year-old as I re-lived the thrill of catching my first fish. I did not care that I could not land the trout. Simply feeling that weight on the line, and knowing that I had hooked this mighty fish was enough. On the drive home, I realized that perhaps I had passed the fly fishing class that Professor Lokensgard offered at Gettysburg College. I had caught a few fish, and even hooked a great monster. I had shared my passion for fly fishing and Judaism with a group of college students and built new connections with them. But most of all, I had found something very rare, a person who loved religion and fly fishing, and I had made a new friend. Great post Eric; sounds like a great trip! Had you remembered your scuba gear I know the ending would have been different. (haha) As it is, a classic "one that got away" story. Wonderful. A great read Eric, as always. A quick point - when you finally land that monster trout - there is a third way! Some if not all taxidermists can create a mount without wasting the flesh of the fish. I believe they take a cast; they may even take the skin? But either way, they will produce a quality replica for you're wall while you still get to eat the meat of your prize catch. That said, it still seems a shame to kill a large fish that is very likely in its breeding prime. So, keep a small one once or twice a year and take a snap of the big ones if and when you're fortunate enough to land 'em. Preserve the memory and keep a clear conscience. Thanks for you comments. It is an interesting idea to create a replica of the large fish and still be able to eat it, so that it does not go to waste. I do however, agree with you that preserving a fish in its breeding prime is important. Had I landed that large fish, I would have released it. I have to say I almost didn't live up to my ideals when I landed my best brown trout. Fortunately I had my good friend Pete of Paddling My Own Canoe to remind me just what was the right thing to do. Here's the proof that 24" of wild brownie lived to swim another day! No need for a trophy mount, just some snaps to spark the memories. Always interesting to read your blog. Years ago I was given some advice about playing large fish by an old guide. He simply said, "When he pulls you don't and when he don't you do". Sometimes it works... sometimes not so much. krafty,Great picture! Wow that was an amazing trout. Steve, thanks for the good advice. Hopefully I'll hvae the chance to hook a large fish again sometime soon. great reading you as always. there is NO need to kill the fish for a trophy mount. several outfits make stunning mounts from a good photo and correct measurements (length and girth). one just has to take care to leave the fish in the water, or at least as much as possible when doing the measurements. i've seen many of these mounts and they're just beautiful. no difference whatsoever from the traditional method. it's really impressive. Cabela's among others offers this service. check it out. their price is $11.99 per inch. Thanks for your comment. That's great to know that you can get a mounted fish even after releasing it back into the stream! Rabbi Eric Eisenkramer serves as the spiritual leader of Temple B'nai Shalom in East Brunswick, NJ. He discovered his love of fly fishing in his hometown of St. Louis, and currently fishes the cold water streams of New Jersey and New York. Rabbi Eisenkramer received his undergraduate degree at Tufts University and was ordained from the Hebrew Union College in New York City. Click on the book image for more info! Your e-mail address will remain confidential and will not be shared. Recycled Fish Transitions to New Leadership – and an updated logo. Scientists Confirm What Fly Fishers Already Knew!